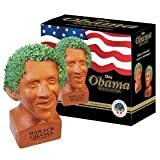 Now you can show your support for our nation's first black president, all while growing out his organic 'fro. Available in both "happy" and "determined" facial expressions. 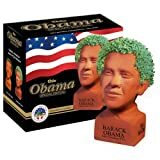 Obama the Chia Pet ....Really...This is way overboard! The best piece of shameless exploitation of Obamamania on the net. Just add water and watch it grow!